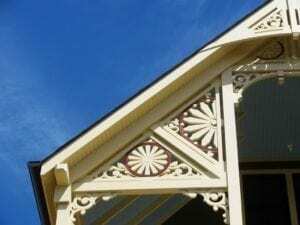 Victorian decoration – gingerbread ornamentation and fretwork are features that make people stop and admire a house. It is these features that give a house that extra charm and character. The more ornamentation the better sometimes making the Victorian building look like it was on steroids. 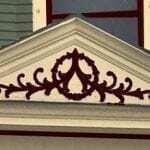 Victorian decoration is admired so that today many homeowners attempt to add Victorian decoration to their own home. This presents a problem, for most homeowners do not really understand architecture and what is right for the style of the house or age of the house. This is a Clown House. Do not make your house into something it was never meant to be. The fan brackets look like they are just stuck on and don’t belong to the house. Don’t do this. 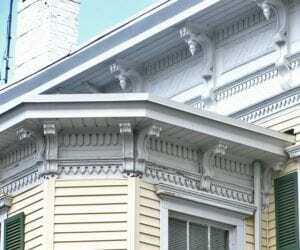 Many homeowners actually attempt to add Victorian decoration to non-Victorian architecture such as a Ranch house or Bungalow. This is wrong – do not try to make your house into something it was never meant to be or the result will be a Clown House. Buy a Victorian if that’s what you like. Many people have plain Victorians and attempt to add Victorian decoration. 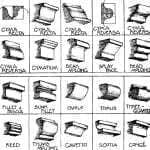 One must understand the architecture to know what can go where and if the ornament can even be used at all. One such example of this problem is the addition of brackets under the roof eaves. If you have open eaves then you cannot add brackets. If the eaves are boxed in then you can add them but you must also add a cove molding connecting them otherwise the brackets will be floating. This is a common mistake that’s made. It is best to consult someone before attempting to do it wrong. Use CAUTION when getting help from a manufacturer that sells Victorian decoration. They will sell you anything to put everywhere possible. The big problem with many online manufacturers is that many of their products are not reproductions but watered down interpretations of original designs. Cornice with brackets. Notice that they are attached at the top and bottom with trim. They may look fancy but their scale and proportion is way off being too thin for a strong Victorian house. The result is a feature that looks added on instead of looking like it was always there. 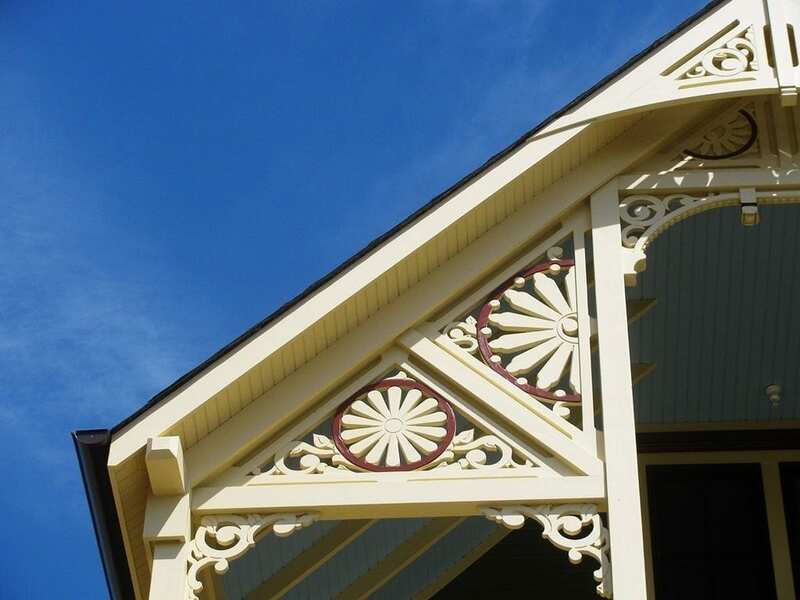 Is Adding Victorian Decoration to a Plain House Wrong? 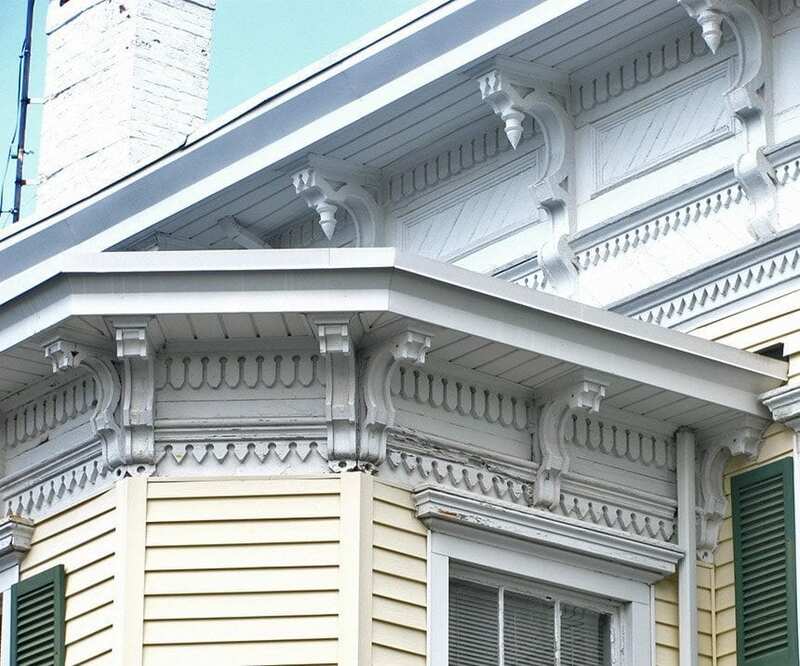 This house was once plain but the homeowner added this Victorian decoration. I WOULD LIKE TO OBJECT to the article “home-Made Gingerbread” which appeared in the April issue of OHJ. In a publication with a masthead “ Restoration & Maintenance Techniques for the Antique House,” this article is about neither restoration nor maintenance. Rather, its publication seems to encourage a form of architectural costuming that is no different from the “Colonial” supermarket, the “Wild west” steakhouse, or the “Victorian” hamburger stand. THERE IS NOTHING WRONG with appropriate frosting on an architectural cake. But when the base is an honest bread-loaf of a building, the result is a bit more tacky than tasty. No PUBLICATION has campaigned harder against the “remuddling” of old houses than has the OHJ. But we feel that this particular case does not constitute “remuddling” – and that what the owner did was quite within the bounds of responsible old-house ownership. LET US SUMMARIZE what is right about this project . . . because there are many occasions when we would be opposed to architectural embellishment of this type. Historically Significant Houses. These may be houses designed by a famous architect, or someone famous may have lived there, or something significant may have happened there. Architecturally Distinctive Houses. These are houses that have a clear architectural style or detailing that fives them character. “Plain” Houses. These are essentially unornamented, functional boxes with minimal architectural detail. This type of house is especially common in rural areas where they were built as farmhouses. HOUSES IN GROUPS #1 and #2 deserve to be preserved or restored along the lines of their original appearance. But houses in Group #3 present a more complex question. Because architectural indifference or a lack of money prevented the original owner from building a more distinctive house, does that mean the every subsequent owner should feel duty-bound to preserve the plainness? WE FEEL that houses in Group #3 can be architecturally enhanced . . . as long as the work is done in good taste and in keeping with the spirit and style of the house. 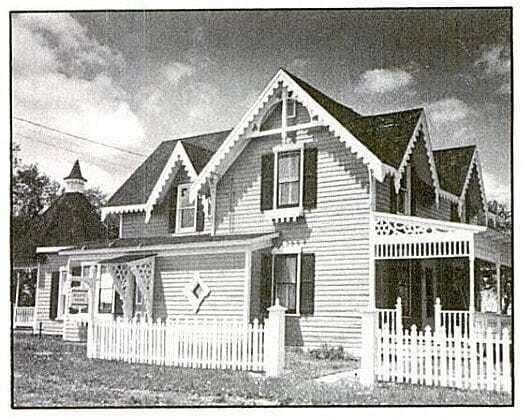 IN THE MID-19th CENTURY, many plain farmhouses such as the house in question were enriched with vergeboards, brackets, gable ornaments and porch scrollwork. Today’s preservationists would argue that this embellishment should be preserved as part of the architectural history of the house. Should we argue that plain farmhouses can no longer be ornamented because this is 1980 rather than 1880? We think not. THE HOUSE in the April case history obviously falls into Group #3. Thus from our standpoint the only argument is whether the architectural enrichment was in good taste and appropriate to the house. And we believe it was. THIS SHOULD NOT BE TAKEN as free license to add fripperies to every old house. But when thoughtfully and carefully done, the architectural enhancement of Group #3 houses can add to the enjoyment of old-house ownership and add something to our cultural heritage that future generations will be happy to preserve. My professional opinion is that both parties make very good points. There is nothing I hate to see more that poorly added Victorian decoration. If you are not a professional I suggest you speak to one so you can do it right. If you can’t do it right then don’t do it at all. Don’t make your house a Clown House! If you like Victorian decoration, check out this link to photos of Victorian homes in Alameda California . The points the reader makes reflect some of my reasoning for dropping my subscription to OHJ. I was in on the ground floor when there were holes punched in the ivory paper–no ads back then. Lots of life style magazines sold their souls and lost their purist readership. I feel the same way. I try not to be too purist, but I see too much tearing out of good old stuff to “update” old houses. I really did not like the most recent OHJ redesign done a few years ago and hung in there for awhile, and it seems like they would have one good issue, and then one not so good. I think they were trying too hard to become This Old House magazine and did not succeed, and in the process lost a lot of content and what made them good, plus the smartphone ready layout didn’t look good on paper. I gave them detailed critiques for a few years and finally let the subscription lapse. 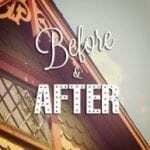 I really object to OHJ additions and remodeling online guides. Most of the additions are totally oversized for the houses, and it is a marketing thing to sell modern building products. If they had more variety of examples and included more small additions, I would have been more on board. I still subscribe to This Old House, which I think is a lot better than the TV show, but it isn’t really historic preservation. 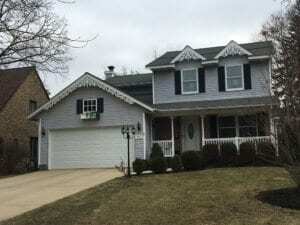 A lot of the “old houses” featured are from the 1980s and 90s. They have a new online subscriber service, but failed to mention anywhere how much it would cost after the first free month, which is so dishonest. Their website has some decent stuff if you look hard enough, but it is really bogged down with ads and slideshows. I have told them too a few times that their TV show goes too much for the total rehab with big budgets and huge kitchens (esp. hated the one a couple of years ago where they tore out the entire interior of a Cambridge Queen Anne to make it Scandinavian Modern). I would dearly love for them to take 3 or 4 nearby similar homes and renovate them for different budgets, illustrating the design decision and triage process. I feel like most magazines offer up such a sterilized look, even if technically “restored”. It’s what most people seem to want. I personally prefer for things to retain some patina and show their age. Maybe it’s that some of us tend more towards the preservationist end of the old house loving spectrum? So I’ve been struggling with this a bit. 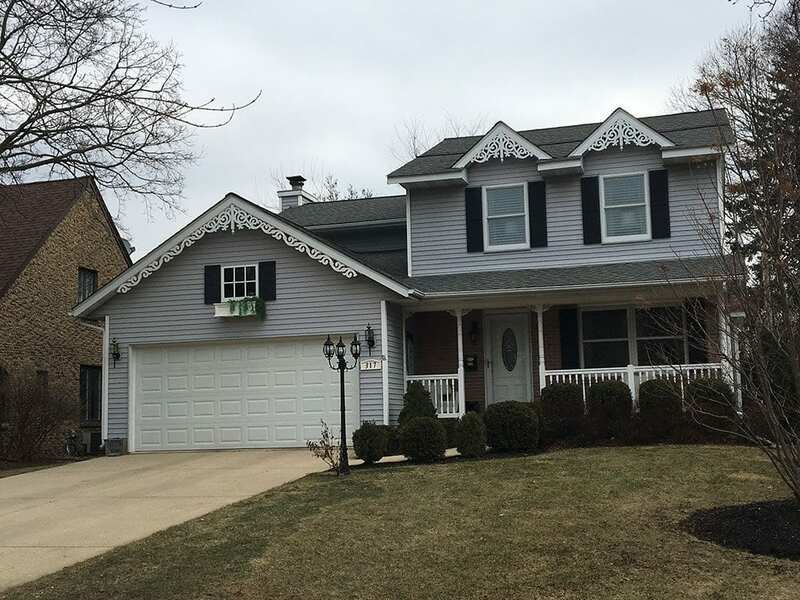 We have a 1920’s bungalow, which has very few details on the exterior except for it’s distinctive roof line and brick columns on the front porch. There are some basic outriggers as well. I think that brackets would be a suitable addition and there are many bungalows on my street with them as well, but I don’t think they were originally on the house. Ken, I’d be interested in your opinion whether to add them or not. Hi – Bungalow’s have their own style of brackets. If they are the right kind, maybe but I would need to see the house first. If there are rafter tails then that should be enough. The details on my 1908 bungalow are more Victorian than Craftsman: the original front door has an oval, beveled glass window; the doors and windows are topped by heavy crown moldings. I wanted to add some detail to the front porch, but was savvy enough to know that turned spindles would not be right. I ended up adding a simple fretwork along the porch roof, made from stock 1×2 pine. I cut the ‘spindles’ 6″ long and sandwiched them between 1×2 rails that fit between the porch columns. I used wood glue and galvanised screws to hold them all together. I then covered up the exposed screw heads on the lower rail with a strip of lattice. This little detail was the perfect flourish my porch needed. I love the shadows it casts in the late afternoon sun. Nobody has ever asked me if I added it –it looks historically correct– sort of ‘transitional Victorian,’ like the house, itself. The best part is it cost less than $50 and took one Saturday to do. It would look, imho, much better on those contemporary houses in your photos than the sham Victorian gingerbread! I wish I could add a photo, I think you would agree with me. I think you are right Victorian decorations are only good on a Victorian house. However not everyone can afford to buy such a house so that is why we do have few clown houses. I personally would love to live in a Victorian house however if I would ever be able to make my dream come true I would probably have to build it from scratch. I’m not able to fully restore the house – even if I removed the asbestos siding, what’s underneath is likely a disaster of missing clapboard and more, and a portion of my house would need to be removed to build a porch again, etc. I’ve drastically improved the curb appeal by painting, replacing the aluminum screen door, and removing overgrown landscaping. My goal has been to bring as much Victorian flavor back to the house as possible, and I would LIKE to replicate the gingerbread for the gables. But what IS my house now? 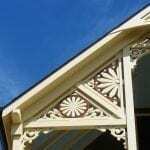 I have spent years researching Victorian architecture (and so appreciate the information you share here! ), and have a natural sense of aesthetics, but there’s a chance that it could end up looking like a remuddled 1920s cottage with gingerbread tacked on, and I would very much like to avoid that. What is your feeling on the most right thing to do here? 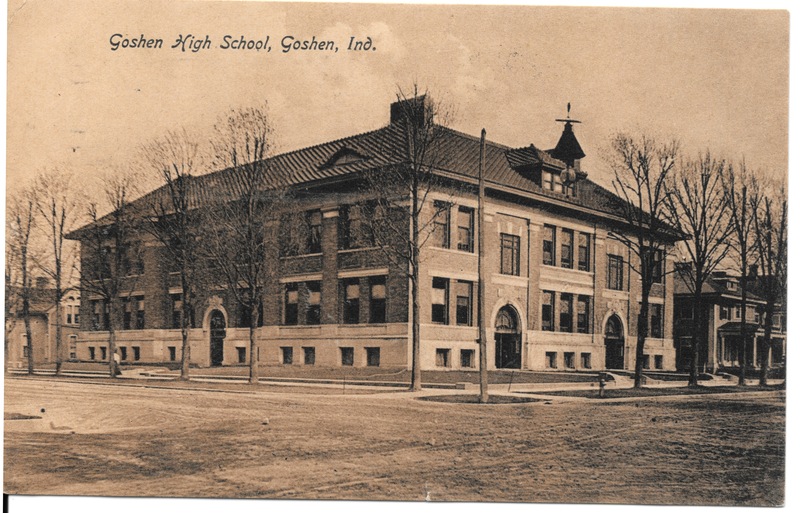 To clarify, my house is on the left side of the historic photo. Hi Rebecca – Do NOT add anything. There are other priorities. Please email me and we can set up a consultation. Now it’s time to restore or replace the decking, posts and and handrails, in addition to adding new gutters and re-roofing. 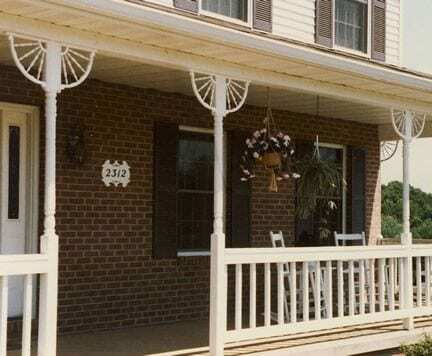 My question is: since the porch remodel was over 100 years ago, should I respect the current style and leave it, or should I compromise by keeping the full porch but replace the craftsman style front beams with a decorative front panel that resembles the original Queen Anne character? First I would recommend trying to repair what you can and not replace. If you replace your railing then code will make you put up an unsightly higher railing. The Craftsman style porch is part of the evolution of the house but since it really does not work with the house and if you are working on the porch anyway, I would bring it back to make it architecturally correct with when your house was built.